You can’t survive in the modern table tennis without a good backhand topspin or backhand drive technique. Coach EmRatThich gives you the best 3 tips to perform the aggressive backhand attack. This stroke is not as powerful as the forehand topspin, but it’s a quick attack close to the table. 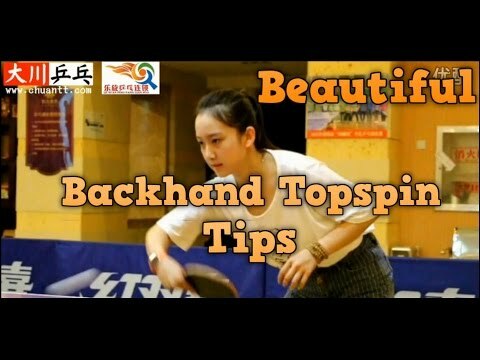 In general, backhand topspin and backhand loop techniques are similar in table tennis. Some coaches would prefer that the loop is the topspin far from the table. But they output the same result: the topspin ball generated by the backhand stroke. The backhand drive technique is a shortened version of the topspin technique. The backhand drive is used to control the pace of the ball. While the backhand topspin is used to attack and win the point. The driving technique generates less speed and spin than the topspin technique. Backhand topspin is performed in front of your body. To do it properly, you need to drop your racket down and folding your abdomen. The advantage of backhand topspin is the speed. It’s not as powerful as the forehand attack, but with a backhand drive or backhand attack, you can control the pace of the game. Put your elbow forward and use your elbow as the axis of rotation which generate the power of the stroke. Drop your racket down, accelerate and hit the ball at its highest position. Follow through and come back to the natural position. The key point of the backhand topspin is the consistency and speeds. Don’t hit too hard, but hit it quickly. Here are the 3 tips to do the backhand loop correctly: Using the wrist, bending the abdomen, and the elbow near the body center. Use your wrist for this stroke. The wrist is placed in the middle of your body and the ball. Brush the ball at the position of 2 o’clock. Because you hit the ball in front of your body, don’t rotate your hip like the Forehand topspin, but just lower your knee, and bend your abdomen. This action is quick and can add power to your backhand topspin. Don’t open too much your elbow, keep your elbow at the center of your body. If you open too much, the ball can go to the side of the table, and you don’t have enough time to fold the elbow for the next shot. Learn to control the ball with spin and consistency first. And then, drop your racket down further, and accelerate to add more power later to your backhand loop technique. If you want to attack the ball over the table, use the backhand flick. Watch the Ma Long backhand technique to topspin the heavy backspin ball. Or Zhang Jike’s new backhand flick technique. Is this article good? Please rate it [ratings]. hi, i have a 13 yrs old daughter, and she started playing TT last 4 years with a long pips in her backhand, im just wondering if its still relevant and can keep up with regards to the new ball (materials) and technique? i see small amount of player in an international level with long pips. Hi Vincent. If you want to let your daughter play long pips on her backhand, you should train her a defender. You are right, long pips defensive style doesn’t have the advantages in this modern table tennis.